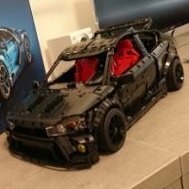 I made this pick-up almost two months ago (before I joined Eurobricks) and I would really like to hear your thoughts about it. It is 50 studs long, 28 studs wide, 15 studs high and weighs 1285g. 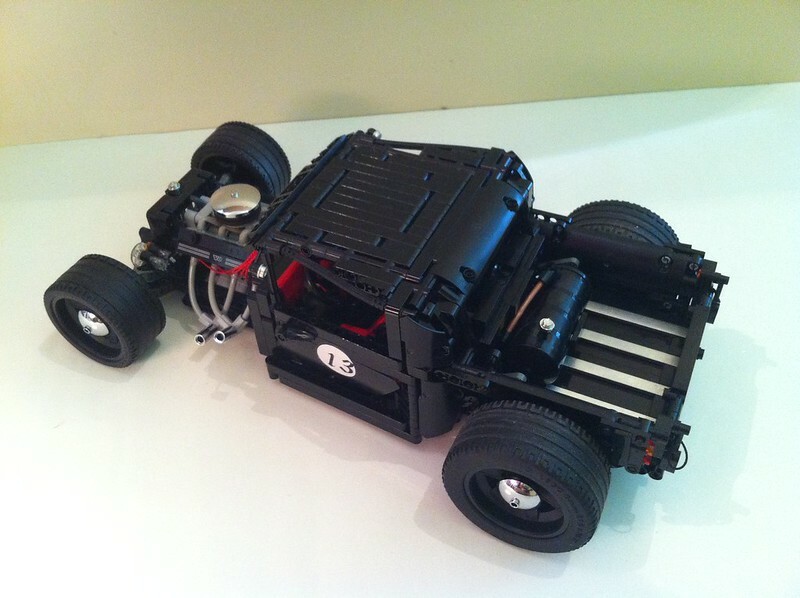 Motorized and remotely controlled - 2L motors (driving), stereo motor (steering), 8878 battery, V2 IR receiver. Front tires from 8070 supercar, rear from 42000 Grand Prix Racer. Working V8 fake engine with some details to make it resemble real V8 engine, connected directly to the driving motors - works at the same speed no matter what gear you choose (in neutral also). Suicide doors with working door handles, Rear doors and roof window can be opened. Fake fuel tank and chrome stripes in the cargo area. Power is transmitted to the rear wheels through 4 gears manual gearbox. Leaf spring suspension with height-adjustable rear (manual with levers in the cargo area). Working turn signals (front and rear) - connected to a servo motor via coupled PF switches. Retractable license plate (simple manual mechanism). Lights (front and rear) manually controlled with a lever behind steering wheel - connected to a speed dial of 8878 battery (on/off and low/high beam). Working radiator fan, connected directly to a V8 engine. Nice great details, I especially like the turn signals. To be honest I don´t like hot rods but this has much to see, RC, gearbox, ligths and on top leaf springs , very nice work, from now on I'll see hot rods . For me it could be a Hall of Fame member. Loving the details, well done! A great amount of functions and details! The turn signals are really innovative and without using any custom electrics! Thanks! I'm glad you like it! I wanted to gain additional functionality, without adding extra motors/IR receivers, so I used second output of the servo motor for turn signals mechanism (with no custom electrics). I don't like hot rods either, but this one is great. 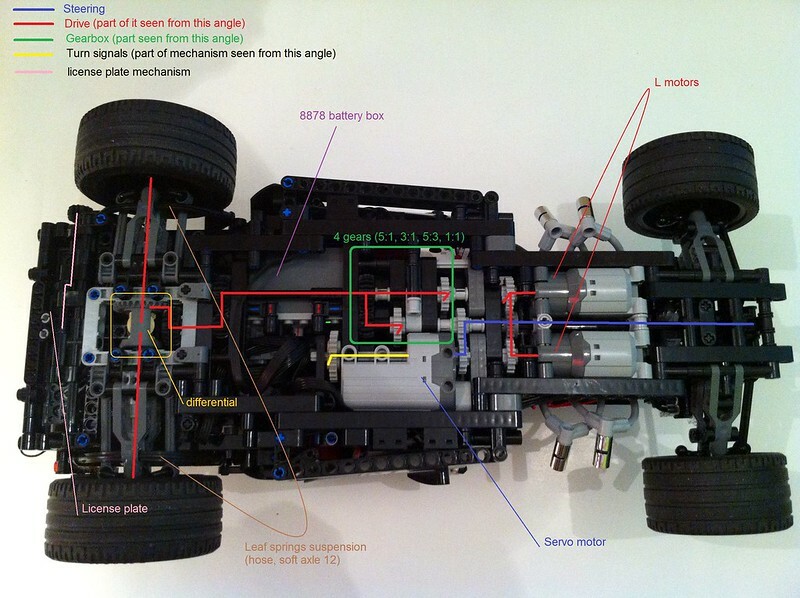 Technically (adjustable leaf springs, hideable number plate, etc.) and optically as outstanding as it can be. Hall of Fame for sure! Wow, thanks jorgeopesi and PhyBuilder! I wasn't interested in hot rods either until I started making one (mainly because I thought that, due to lack of body parts, it will be lighter = faster). 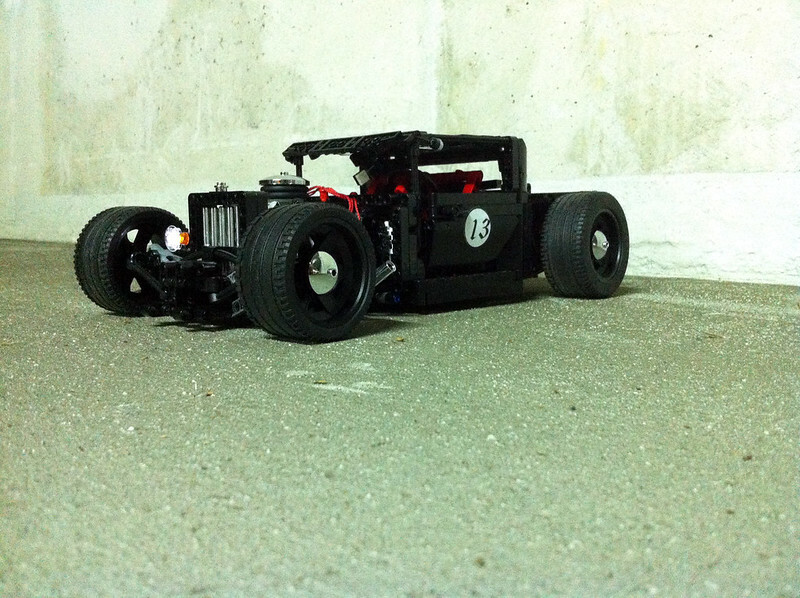 But after studying few real hot rods, in order to make a realistic LEGO version, I became their big fan. The turn signals are very neat. And I love the fake fuel tank and chrome strips in the cargo area. Thank you very much Jim! I'm happy to be here! You have now been entered into the Hall Of Shame Fame. Wow! Thank you very much!! I'm flattered and extremely happy! First a very warm welcome here at EB and what a entry . 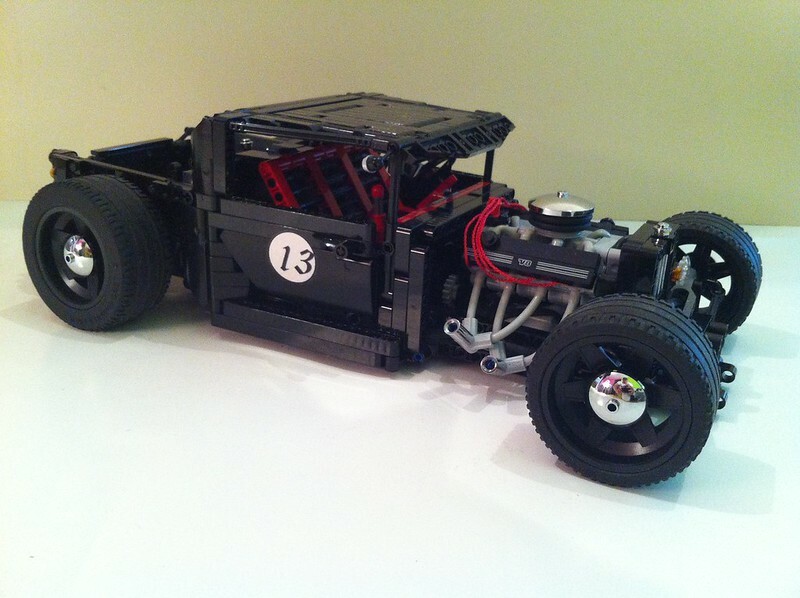 Your Hot Rod is hot like hell and awesome cool, with great technic jused . Excellent model! However, you would be hard pressed to find a hot rod in real life that has leaf sprung independent rear suspension. Welcome to Eurobricks. I think it's a great model. Some clever features, I love the steering and ride height adjustment. I second that idea this should be a Hall of Fame member ,its wonderfully detailed and very original. Beautiful details and plenty of functions, what a great MOC! Thank you very much for your comments, I'm really glad you like it! Thank you Technyk32231! You're right, they mostly have live rear axle, I'll keep that in mind for future hot rods - thanks for suggestion! VFracingteam and Horace T, thanks for the warm welcome, It is a great pleasure to be here! Thank you very much for your kind words, it means me a lot! Wow this is awesome, any chance of instructions?.